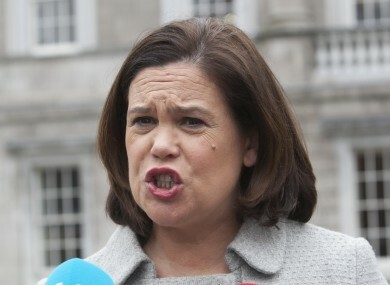 MARY LOU MCDONALD has claimed she was subjected to “heavy-handed and very invasive” security searches when she left the US last week and intends to meet with the US ambassador to Ireland over the matter. The Sinn Féin deputy leader was speaking in the wake of the controversy over the White House’s refusal to allow Gerry Adams to attend an event to mark St Patrick’s Day last week. Asked what he would be saying in his letter, Adams said that while he accepts the apology, he does not accept the explanation for him being refused entry. Speaking at Leinster House today, McDonald said: “I was subjected, along with my colleagues, to not just rigorous, but what I consider heavy-handed and very invasive security searches. I challenged that situation, as I have on each occasion that we’ve been leaving the United States, and I intend to follow it up. It’s completely, at this stage, almost off the wall to be pursuing people like us in this manner. Certainly people have to be kept safe and all the rest of it. We represent absolutely no threat to anybody and I think they know that. McDonald said that Sinn Féin representatives have been subjected to this level of security checks while entering and leaving the United States for a number of years, but said events at the White House last week had brought the matter to a head. The administration in the US is well aware that Sinn Féin and the leadership of Sinn Féin over many years have been architects of the peace process, are a force for good, for positivity, for democracy. “And whereas stringent security is defensible, singling people out, it seems to me simply on the basis of your political view, is not an acceptable thing to do. Those of us who need visas or visa waivers have to send a detailed itinerary to the appropriate agency and through the consular services here in this country and we do that. We also have to give notice of our intention to travel and we do that as well. Email “Mary Lou says she was subjected to 'very invasive' security searches in the US”. Feedback on “Mary Lou says she was subjected to 'very invasive' security searches in the US”.